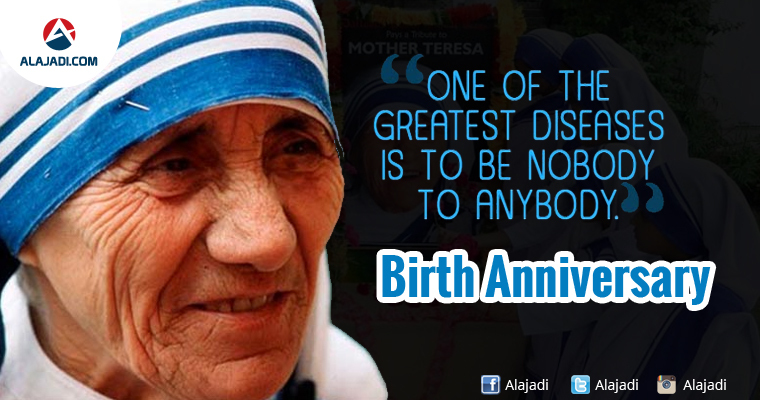 » Life History of Mother Teresa on her Birth Anniversary ! Prayers marked the 105th birth anniversary of Nobel laureate Mother Teresa in Kolkata today. At the mother house, headquarters of missionaries of charity, which was founded by Mother Teresa nuns of the order started the day with special prayers in the memory of her. Mother Teresa was born on August 26, 1910 at Skopje in Macedonia. She died in September 5, 1997 at Kolkata. Agnes Gonxha Bojaxhiu was born Aug. 26, 1910, in Macedonia to a financially comfortable Albanian family (they owned two houses, one of which they lived in). Her father died when she was 8, ending her family’s financial security. Agnes was fascinated with missionaries from an early age, and by 12 she knew that she would commit herself to a religious vocation.When she was 18, Agnes left home and joined the Sisters of Loreto in Rathfarnham, Ireland. Although she lived to be 87, she never saw her mother or sister again after the day she left for Ireland. After a year learning English in Ireland, Agnes transferred to the Sisters of Loreto convent in Darjeeling, India. She took her vows as a nun in 1931, choosing the name Teresa to honor Saints Therese of Lisieux and Teresa of Avila. Therese of Lisieux, the patron saint of Australia, is also the patron of missionaries, florists and AIDS sufferers, among others. Spain’s patron saint, Teresa of Avila, is also the patron of religious orders and lacemakers. Sister Teresa began teaching history and geography in Calcutta at St. Mary’s, a high school for the daughters of the wealthy. She remained there for 15 years and enjoyed the work, but was distressed by the poverty she saw all around her. It took two years of preparation before she was able to begin doing the work she felt compelled to do. She needed to receive permission from the Sisters of Loreto to leave the order while retaining her vows – as well as permission from the Archbishop of Calcutta to live and work among the poor. She also prepared by taking a nursing course. In addition to promoting literacy, Teresa taught the children basic hygiene. She visited their families, inquiring about their needs and helping provide for them when she could. She went on to open a hospice for the poor, a home for sufferers of leprosy, and a home for orphans and homeless youths. Mother Teresa was honored with many awards throughout her life, from the Indian Padma Shri in 1962 to the inaugural Pope John XXIII Peace Prize in 1971 to Albania’s Golden Honour of the Nation in 1994 and, most famously, the Nobel Peace Prize in 1979. 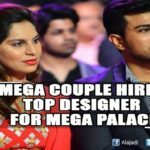 She refused the traditional Nobel honor banquet, instead requesting that the $192,000 budget be given to help the poor of India. She continued her work with the poor for the rest of her life, leading the Missionaries of Charity until just months before her death Sept. 5, 1997. The Catholic Church has begun to move Mother Teresa along the steps toward sainthood, and she was beatified in 2003. 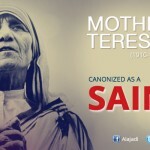 Her official title is now Blessed Teresa of Calcutta.